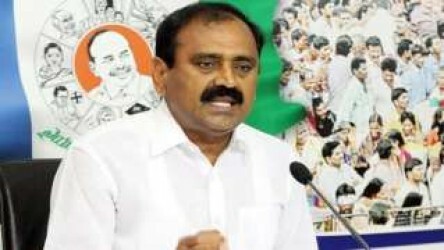 Vijayanagaram: YSR Congress Party (YSRCP) General Secretary Bhumana Karunakar Reddy severely criticized Andhra Pradesh Chief Minister Chandrababu Naidu for wasting time by conducting review meetings ,while the public were struggling for survival in the aftermath of Cyclone Titli. Speaking on the occasion of the protests at Sunna Devi Centre in Palasa here, against the government for its failure to carry out the relief operations, the YSRCP leader said that Chandrababu was taking pleasure out of the struggle of the Titli victims. Locals of Uddanam, Kothuru Junction, Pathapatnam and Palasa in the district took out protests condemning the TDP government's carelessness in taking relief measures. Bhumana lambasted the State government for ignoring the cyclone victims who were struggling without food and basic needs since three days. Adding that Chandrababu's promise to offer help to the victims was synonymous with those made during the 2014 elections, he observed that even after three days of the disaster, the government officials were not accessible to the people. The YSRCP leader demanded to why there was no electricity in the district three days after the cyclone, despite Chandrababu claiming to have turned the State as a No.1 State in usage of technology. Hundreds of vehicles were blocked on the Palasa-Mandasa highway with the farmer protesting in the district. "The government's functioning resembles that of the droughts in Rayalaseema region in the past. People are compelled to block the roads in demand for food supply," Bhumana remarked. Meanwhile, commotion erupted when the locals had blocked the local Tahsildar from entering the district demanding the relief operations.